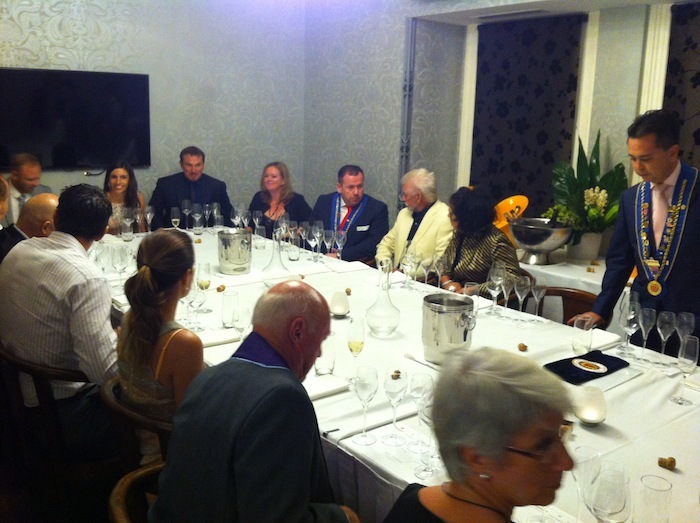 On Wednesday 27 February 2013, I was one of 19 people attending a Chaîne des Rôtisseurs Champagne Masterclass at Perth’s newest boutique hotel, the Terrace Hotel. The highly knowledgeable and experienced Champagne expert, LVMH Champagne Ambassador Greg Williams, presided over the evening's proceedings, which was organised by Perth Vice-Echanson Valerie Stopp. Unlike normal Chaîne events, this was an Ordre Mondial Des Gourmet Dégustateurs event which focused on the wines rather than the food (but the canapés and little things that the Terrace Hotel brought out to keep us from wantonly drinking champagne on empty stomachs were delicious morsels - including decadent salmon and avocado mousse cones topped with lemon crème fraiche and avruga caviar, and poached quail and foie gras). 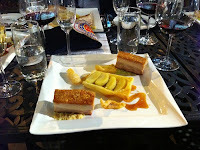 And unlike your run of the mill masterclass (no there were no cheese and crackers! Not that there’s anything wrong with that …), the discussion and education included not just the champagnes that were featured, but also the champagne houses, their history and the winemakers, most of whom Greg had met during his career with LVMH. Did you know that the first thing every newborn baby in the Krug family tastes is a finger dipped in Krug? Vice-Chancelier Amanda Spencer-Teo decided that her new go-to champagne is the Ruinart Blanc de Blancs, with its “luminosity”: fresh, bright, soft and honeyed flavours, an explosion of mid-palate chardonnay flavour and a minerally crisp finish that made drinking it so easy, most people had finished their glasses without realising it. Fortunately, the Terrace’s sommelier Emilie DeBeve kindly topped everyone up. 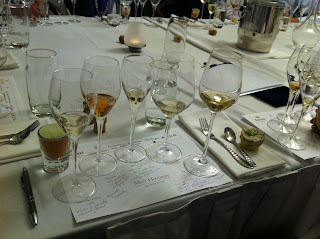 We also learned about the differences between the various Champagnes, easier because we got to taste them side by side. With the staples, the dominance of pinot noir in Veuve Clicquot’s Yellow Label is all about power and audacity: a meatier, bigger, flavour; whereas Möet et Chandon’s Brut Imperial, with more pinot meunier and less pinot noir by comparison, has a softer flavour with a crisp, dry finish. At the top end, we learned Dom Perignon is made to bring out the best of the unique characters and flavours of each individual vintage, while Krug Grand Cuvée is made to transcend the “NV” and vintage stereotypes to deliver the same amazingly delicious, complex, multi-layered experience every year. And when sampled next to the Dom Perignon, it was amazing, with a seemingly never-ending length of flavour that lingered long after the swallow. 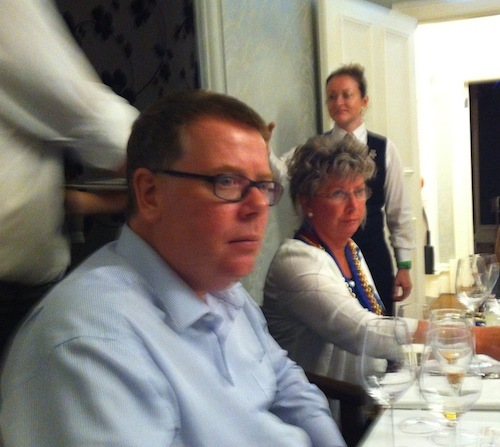 There was even an interesting debate between Greg (the veteran traditionalist) and Emilie (the young modernist) regarding the merits of decanting a fresh bottle of Champagne in a carafe to soften and regulate the flavours.